These easy to make, Greek inspired appetizers are going to disappear quickly. Be sure to make plenty of these lovely little bundles of joy. Enjoy! 2. In a skillet over medium heat, heat the olive oil and sauté the onions until they are tender. Add the garlic and sauté for another minute. 3. Add the spinach and cook for 5 minutes. Add the herbs, feta cheese and lemon juice; mix well. Transfer the spinach mixture to a bowl. 4. Whisk one of the eggs and add it to the spinach mixture; mix well. 5. Cut each of the puff pastry sheets into 9 equal squares. Spoon a small amount of spinach into the center of each square. Don't add too much or they will not close properly. Bring the corners of each square to the middle and create little bundles by pinching the dough together at the top. 6. Place the bundles on a baking sheet. Whisk the second egg and brush the tops of the bundles with the egg. Bake for about 20-25 minutes or until golden. They're so pretty! And they look fantastic - I love spinch and feta together. I just bought a huge tub of feta from Costco, so I'll keep this recipe handy! oh they look like a great appetizer for a dinner party, or for a small-bites meal! YUM. Don't those look just delicious?! I love this combo, what a treat. I make this recipe often and it's always so delish. I love everything about it, bravo!!!! Your photos are so beautiful, keep up the great work. 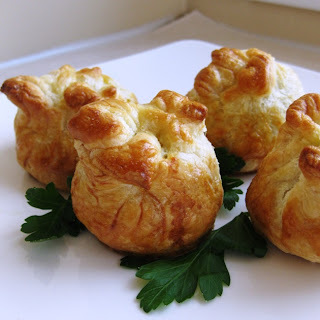 The feta bundles on your recipe look soooo appetizing! Can't WAIT to try making some. Thank you for your comment on my blog (chai cake). God bless you. Another one knocked out of the f*****g park! You are amazing, and it's an honor just to be i' the sun. These bundles are adorable and look just scrumptious! Yum! yummy! love spinach & feta together. I'm so jealous, my pastries never come out looking that perfect! delicious! I could make a meal out of appys! Wow - these look REEEEEALLY good!!! Oh My! These look ever so delicious!! You always have the very best stuff!! Wow i am so so going to make this, instead of spincah can i use some other veg? Oh heavens I really love these little tasty treats. And yours are so puffy. These would be very bad to have around me, very bad. oh yum, these look so good!! And they're so pretty, too. What a great appetizer idea! Mmmm, spinach and feta, one of the world's best combinations. I like they way you bundled them; just a little different (and cuter)than spanakopita! Why is that, Dragon, why? I want to be like everyone else and like the combo! OMG. Those look so good. I'm so hungry right now for lunch. Those look so much better than anything I'll eat. Bundles of goodness! I could go for one right now! Oh those look wonderful! I love anything with Feta...I swear I could eat that stuff plain!! HAHA What a great looking party appetizer! These are so pleasing to the eye Paula, beautiful!! My belly likes them too! Oh man, these are exactly the type of appetizers that I overindulge in before dinner is served - so good! my mouth just drooled, delish! Oooh, these look so yummy! Delish! I guess these were part of your dinner party too! Can't wait to see the rest! Very pretty little bundles. I could eat a meal out of appetizers and wine! I'd like to try these sometime! my mom taught me this eastern european recipe called "pita" involving filo dough, spinach, and feta. i imagine this is just as good! I have something like this at Greek Easter. Your's look wonderful. Thanks for sharing! Wow I am impressed. Looks like my kind of treat. if you dished this out on a tray to me, they would all be gone in a flash! very impressive, adorable delicious little bundles! I bet you can use phyllo dough, too! 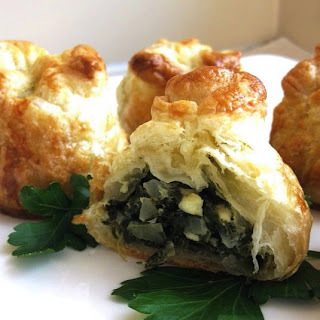 Spinach and feta is such a great flavor combination. I can imagine how good it would be wrapped in pastry! Congratulations on your Blog, fantastic work. These look great! And, they're perfect for a party. i really need to start using puff pastry. these look fantastic. Great for appetizer. I will try it next time I entertain. Just look at that light and flaky golden brown pastry! The spinach filling sounds really good! It looks so professional. Your dough looks perfectly flaky. I've just bookmarked your site. I love this as an alternative to spanakopita. I hate working with delicate filo dough, so this is perfect! Nice Greek touch, I made something similar by turning phyllo in purses....and yes...gone in minutes!